These characters have to become more gangsters than they are cops in order to beat the gangsters and clean up the city.” Director Fleischer described Brolin’s character as “he wants to rid the city of evil in the same way he wanted to help save the world in World War II. The stars and filmmakers of “The Gangster Squad” recently talked about the film’s story and characters at a Warner Bros. press junket. 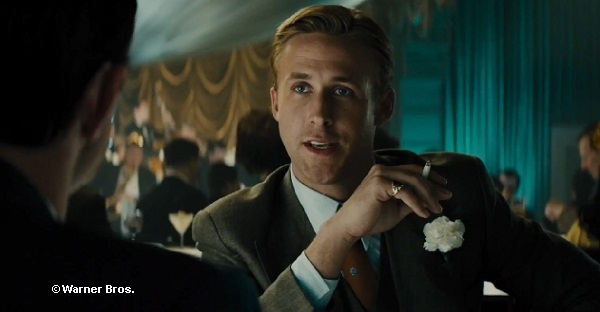 Director and executive producer Ruben Fleischer said that the “Gangster Squad” script reflected a period in time that was elegant…a world that he wanted to live in that inspired the making of the film. 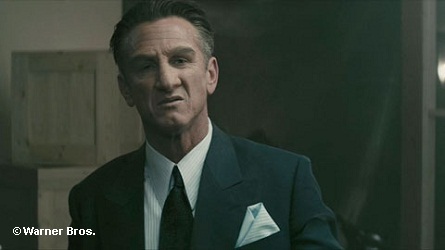 Sean Penn as “Mickey Cohen”. On Ryan Gosling, Fleischer stated that he is “truly an amazing actor and brought so much to the role and to the movie.” Fleischer has great fondness of Emma Stone and remembers his days of working with her on the film “Zombieland” when thinking about her for the role of “Grace” in this movie. He stated that he “just fell in love with her on screen” and that she is “someone that you can not take your eyes of of.” Fleischer also said on Stone that when she starred in the dramatic film “The Help” it showed audiences a new side of her outside of the regular comedic roles that she had been playing. Brolin talked about his character by stating, “The pride that his character has for his home town after coming home from the war – he identified with and wanted to be part of it. With this one I felt a real connection. He has honor. He’s considered a guy that’s hard to place because he doesn’t heed to all the rules. He knows what has to be done and doesn’t like the red tape. He starts recruiting guys. These guys went to war. Suddenly there’s brothels everywhere. 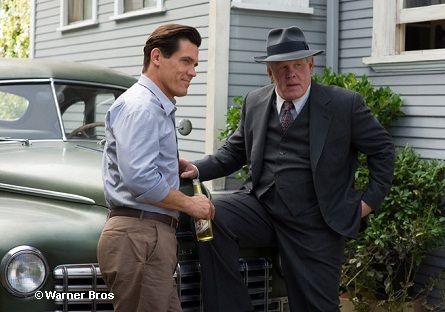 Pictured: (l-r) Josh Brolin as “O’Mara” and Nick Nolte as “Chief Parker”. Emma Stone with Ryan Gosling in “The Gangster Squad”. 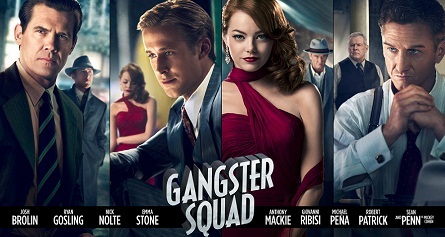 “The Gangster Squad” opens in theaters Friday, January 11, 2013.